Elijah Estrada, 10, is shown in a photo with Noah Abbot, 2, alongside another photo of Noah and Jeremiah Abbot, 3. HESPERIA, Calif. -- The body of a 2-year-old boy was found Thursday nearly two weeks after the car his family was in crashed into an aqueduct in Hesperia, according to a family member. San Bernardino County sheriff's dive team members and deputies responded to reports of a toddler's body found near South Farmington and 7th Avenue. Authorities believe the body is that of Noah Abbott, but said the coroner's office would officially confirm the identity. The crash happened the evening of March 2, when the car Noah, his mother and two brothers were in careened off the road in the 13000 block of Main Street and flipped over into the aqueduct. His mother, 31-year-old Cristina Estrada, was pronounced dead at the scene. 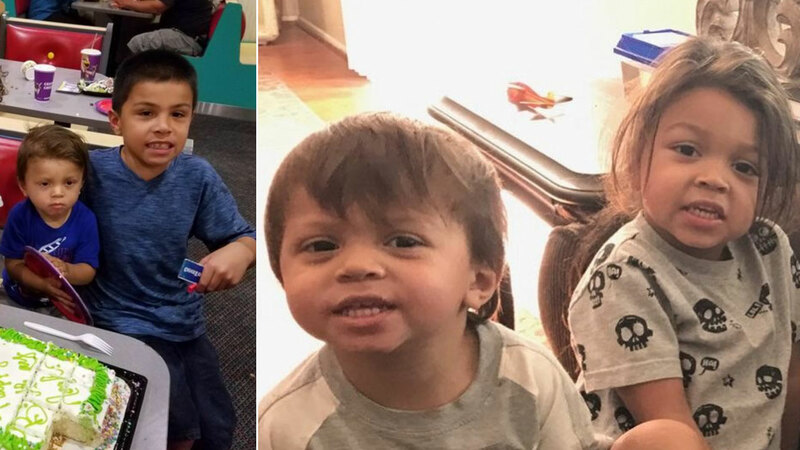 Dive team experts pulled his brother, Jeremiah Abbott, 3, out of the water and rescued his other brother, Elijah Estrada, 10, who was found clinging to a float. Jeremiah died at the hospital, while Elijah survived and was released from the hospital a few days later. Noah's body had not been found the day of the crash. Authorities scoured the aqueduct for Noah, but ended up calling off the search on March 4. The frigid waters and poor visibility had made the search difficult. A GoFundMe page has been created to help pay for the family's funeral and medical expenses.